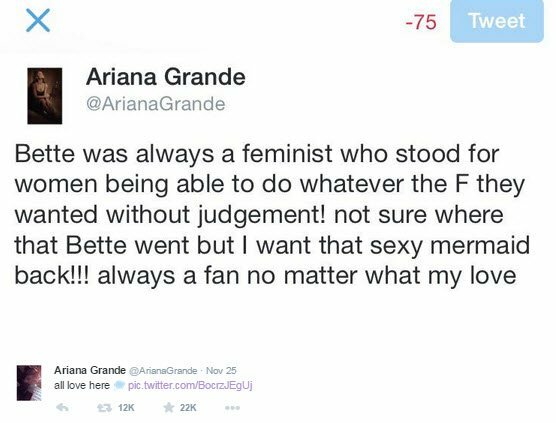 Ariana Grande responds to Bette Midler's harsh words. Ariana Grande shames Bette Midler for calling her names. Uses a mermaid. Genius. Nothing like an argument between a 68-year-old legend and a 21-year-old pop star to brighten up your day. Bette Midler and Ariana Grande. NOT friends. 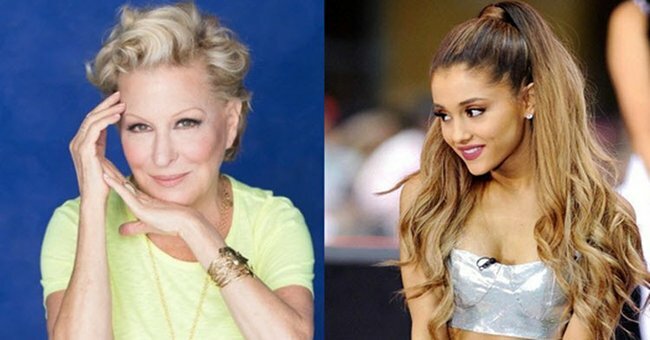 Yesterday, Bette Midler had a go at Problem singer Ariana Grande. Called her ‘silly’. Called her ‘high-pitched’. Pretty much called her a ‘couch-slithering whore’. But Ariana took it pretty well. At least, she took it pretty well where it matters – on Twitter. The 140 character limit just wasn’t enough for Ariana’s defensive but kind statement. She had to screenshot her long response and Tweet the picture instead. WELL PLAYED. She also posted a photo of Bette dressed as a mermaid, with the caption “all love here”. She shamed Bette. She shamed Bette good. But Bette came back with an apology… sort of. Okay, Bette and Ariana. Glad we got all the whore-calling out of our system. Let’s try to get along now, divas.